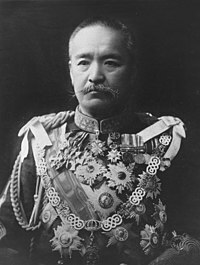 English: Prince Katsura Tarō (桂 太郎, January 4, 1848 – October 10, 1913) was a Japanese politician and army officer during the Meiji era and Taisho era, and a retainer of the Mōri clan. He served as the 11st (June 2, 1901 – January 7, 1906), 13th (July 14, 1908 – August 30, 1911) and 15th (December 21, 1912 – Februaly 20, 1913) Prime Minister of Japan. Media in category "Katsura Tarō"
This page was last edited on 13 May 2018, at 13:58.